﻿ GNP Equipment | Hosokawa Alpine Granulator. 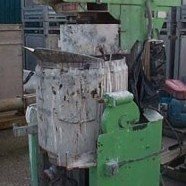 Manufactured by Hosokawa Alpine Ltd. A re-work plastics granulator system consisting of a Model 20/12 RO granulator which ids powered by a 4 kw 1440 rpm drive motor. The unit has got two dead knives and two fly knives on a 200 mm dia. rotor , the unit is fitted with a 3 mm perforated screen. The feed throat is approx. 170 mm x 130 mm. This unit is fully interlocked. A complete system with granulator,fan unit and cyclone collector. Was last used for CD Discs.